Professor Adeola is currently a professor in the Department of Animal Sciences at Purdue University, where he conducts research in energy, amino acids, and phosphorus utilization of non-ruminant animals for improving the efficiency of lean meat production and minimizing the flow of nutrients through animal waste into the environment. Professor Adeola has developed an internationally-recognized research program in energy and nutrient utilization of non-ruminant animals. His research has led the way for cost-effective diet formulation strategies for non-ruminant animals that improve the retention of phosphorus, energy, and nitrogen, the three most expensive dietary components. He served as non-ruminant nutrition section associate editor for the Journal of Animal Science, the Canadian Journal of Animal Science and on the editorial board of Poultry Science. 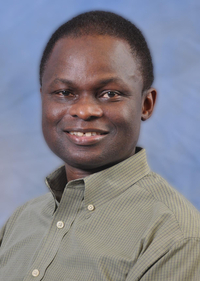 Professor Adeola has authored or co-authored 190 refereed papers, 200 abstracts and book chapters, and several other publications. He received the American Feed Industry Association (AFIA) Poultry Nutrition Research Award in 2005, the Maple Leaf Duck Research Award in 2007, the AFIA Non ruminant Nutrition Research Award in 2007, the Evonik-Degussa Poultry Research Award, Poultry Science Association in 2010, and the National Broiler Chicken Council Research Award, Poultry Science Association in 2012. In addition, he served on the United States National Academy of Sciences - National Research Council Committee that wrote the 11th Revised Edition of the Nutrient Requirements of Swine (NRC, 2012).